Ideally we want to eat a whole plant-based diet that is made up of locally grown organic foods that have not been genetically modified and are devoid of animal products. Now I’m saying ideally because once we are settled this is what we intend to grow and eat but getting there is a longer journey and at the moment we are not there yet, especially now that we moved. We strive to be self-sufficient but at this early stage in our story we are far from it and with limited wo/man power we can only go so fast. So the reality is that we are buying food. Whenever possible and affordable to us we buy local and organic. The big BUT here is that there is very little organic food available and often it is very expensive. So we end up buying non-organic foods and due to that it is very important to us that we make the best choices of the available options. Here in Brazil the supermarkets are being flooded by GMO foods. Thankfully they have to be labeled with a big “T” inside of a yellow triangle. And even then we over look it on occasion. Avoiding animal products is much easier since we hardly ever buy processed foods. Buying local is already a bigger challenge and right now our only possible source is limited to some vegetables we buy at the local market. And still in the end the hardest part is to minimize our intake of pesticides. Agro-toxins seem to be heavily represented here in the Brazilian agriculture business. Of course we don’t use any of these things but that doesn’t mean we aren’t surrounded by them or ingesting them. These pesticides, herbicides, fungicides, and so forth contaminate the soil, the groundwater, harm or kill the bees and other animals, and last but not least our food. The only effective action would be to buy and/or grow organic but since that is quite limited at the moment there is not too much we can do besides trying to avoid foods with higher pesticide contamination. Few good studies have been done about this in Brazil. Usually the food variety being tested is limited and also there is hardly any regional (by state) differences being studied. 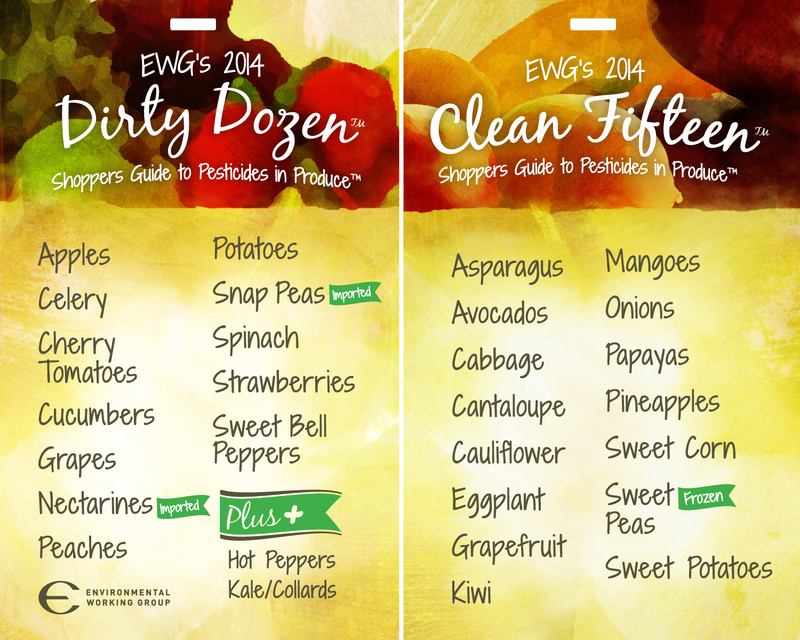 Unlike in the U.S. where the Environmental Working Group, an independent non-profit, publishes yearly their Shoppers Guide to Pesticides in Produce (image below), here in Brazil I am unaware of such work being done. And even though there are many similarities there are also some big differences between how much pesticides are found in each produce. A reference point for us can be a study published in 2012 on pesticide residues in 22 fruits, vegetables, and crop varieties. The researchers (Jardim & Caldas) analysed thousands of samples taken between 2001 to 2010 from seven Brazilian states. Below I reproduced the list sorted in descending order of the percentage of the samples of each fruit, vegetable, or crop that tested positive for pesticide residues. This list is at best a helpful starting point but we would need much more information to make well informed decisions about the food we buy. In the mean time we’ll do our part to rely less on store bought foods.